Divided into three sections, Tone Poems - Book 2: Opuses 4, 5 & 6 from Rocky Nook is the second of Bruce Barnbaum's Tone Poem Books. Containing 91 exquisite black and white images, the series continues his study of the world around us and the visual world he has created. Opus 4: "Between Real and Surreal" examines aspects of our world that are strange, bizarre, and otherworldly. Opus 5: "Aftermath" is a study of the life and death consequences of two major wildfires that struck Southern California on October 23rd, 1978, burning 30,000 acres of shrubland. Opus 6: "Among the Trees" continues Barnbaum's life-long obsession with trees, without which the earth would be a completely different place. 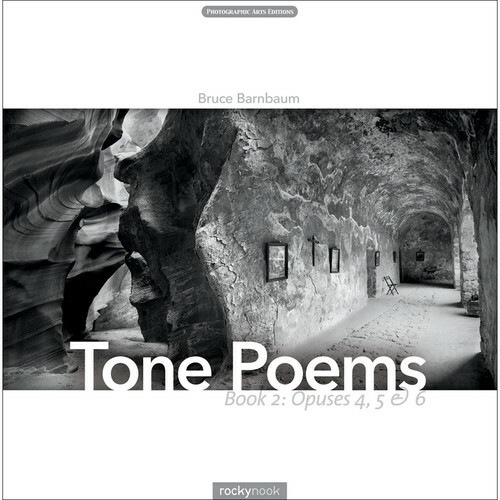 The accompanying CD of classical piano music continues the collaboration between Bruce Barnbaum and Judith Cohen. As with his first book, the solo and trio music was selected to support each opus by mirroring and expanding upon its emotional content and imagery.